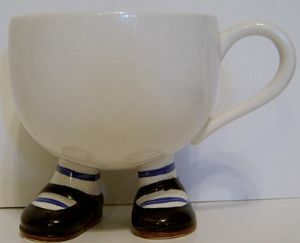 One of the novelty and amusing releases from Carlton Ware in their 'Walking Ware' series. This one is the 'Black Shoed Cup ' . Designed by Roger Michell (Lustre Pottery) for Carlton Ware , these particular pieces were manufactured by Carlton Ware and Price Kensington. The item is backstamped beneath the feet and is dated 1973.